Apogee Instruments is pleased to announce the release of our leaf and bud temperature sensor, the SF-110. The SF-110 is a combination of two temperature sensors (precision thermistors) in a single housing. One sensor is designed to mimic a plant leaf and the other a flower bud. The SF-110 provides close approximations to leaf and bud temperatures and can be used for prediction of frost on leaves and buds. The temperature measurement range of the SF-110 is -40 to +70 °C with an accuracy of ± 0.1 °C from 0 to +70 °C. 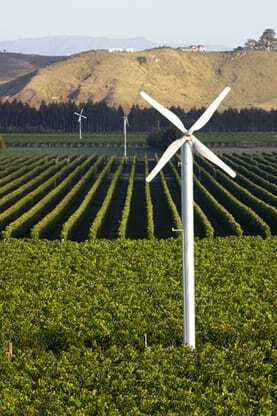 However, the sensor is intended for applications in cropped fields and orchards when temperatures will be near freezing, and where air temperature measurements are not a good predictor of frost formation (Figure 1). The SF-110 offers a simple and effective method of helping growers determine when to initiate expensive frost protection measures, thereby saving crops in addition to operating costs. For more information on the SF-110 please click here >. 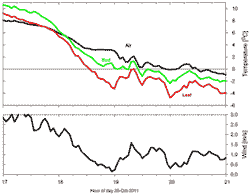 Graph to Left: Leaf and bud temperature approximations measured with an Apogee SF-110 compared to air temperature (top panel) and wind speed (bottom panel) on the evening of October 26, 2011. Leaf and bud temperatures were both below air temperature after 6 PM (hour 18) and reached the freezing point well before the air.